When investing massive capital and human resources into a website redesign or update, how do you make the right design and content decisions to ensure a knockout site that meets stakeholders’ needs? We hope it comes as a huge relief to hear you can’t possibly make perfect and complete decisions at one preordained moment in time. Thriving digitally today means your site (and your management of it) must be flexible and agile, evolving to meet the changing needs of users over time. So, how do you do this when your time and resources are finite? We’ve experienced a paradigm shift—your website isn’t a thick reference book that sits on a shelf, only seeing the light of day when it’s given a good dusting once every year (or five). Instead, it’s a dynamic extension of your organization that needs to be tracked, analyzed, and iterated upon on a regular basis as patrons engage with it. It takes a committed investment by clients to make this shift and build a user-centric, mobile-optimized website. We’ve reached a point where this isn’t optional, though. In fact, it’s a top priority if you want to speak to your patrons, be heard, and generate conversions. The good news is that there are tools that can make this approach rich with information and easy to embrace. 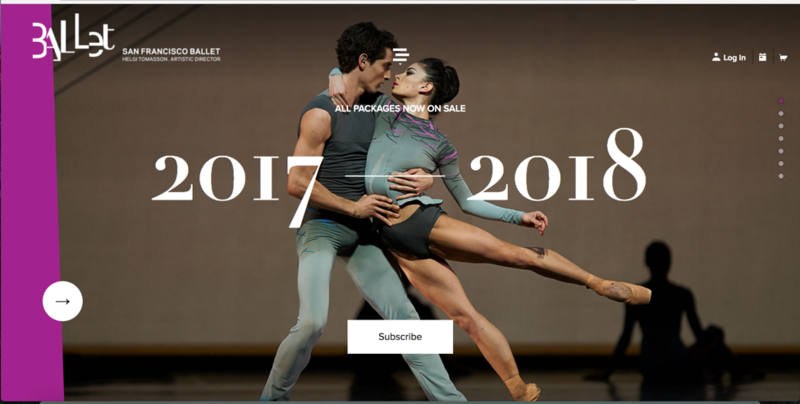 SF Ballet was proactive in adopting this shift when planning their new site, which launched in September 2017. Thomas Weitz, the Ballet’s Associate Director of Digital Strategy, led his team towards a goal of building a content-driven, user-centric website that harnesses the incredible assets of the organization. How are we tracking user behavior on our existing site? How will we make the most of the valuable vendor warranty period post-launch to ensure functionality? How does the new site’s performance compare to the old site? How will we assess the user experience on the new site and know if we’re meeting our UX goals on an ongoing basis? It stands to reason that you should understand what works and doesn’t work on your legacy site before building a new one. While a custom analytics implementation to delve into user behavior on the existing site would have been ideal, time constraints led us to prioritize an exploration of SF Ballet’s existing analytics setup on their site. This was nonetheless beneficial, as it set the groundwork for SF Ballet to be able to compare the new site in a fair, “apples to apples” way. Doing so is a fleeting opportunity- if the data isn’t collected on your old site ahead of time, you’ll lose the opportunity to do so once the new site launches. There’s an endless array of data that can be collected at any time on a website. Clarifying what matters most to your organization is paramount. We worked with SF Ballet to define site objectives and identify measurable Key Performance Indicators (KPIs) to focus data collection. Thomas built consensus amongst internal stakeholders, and then shared the objectives and KPIs with their website development partners to ensure all were aligned on how to define and measure success. For example, with an objective of driving revenue through ticket purchases and donations on their site, we helped SF Ballet identify precise KPIs in the form of user drop-off points in the purchase path that reflected friction in the user experience. Identifying these with an eye towards making improvements for the new site will allow them, in turn, to be tracked and fine-tuned as new data are collected. Ultimately, this serves the purpose of increasing purchase completion rates on the new site. With a clear understanding of the old site’s performance and its implications, Thomas had a vision of taking things to a new level with a robust measurement launch plan for the new site. 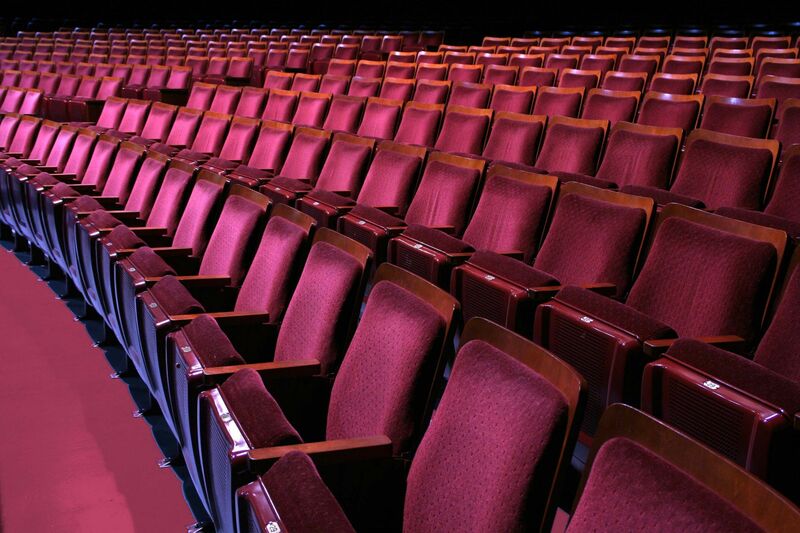 We created a customized solution driven by SF Ballet’s site objectives and KPIs, and automated access to key data through analytics dashboards and reporting to make the data usable to managers in a streamlined manner. The scope of the measurement solution covered many areas, from site functionality and usability reporting, to a detailed infrastructure build for marketing campaign performance and user behavior measurement. The dashboard, and the automated reports, save time and help staff focus on what matters most. For example, SF Ballet invested in content reflecting the stunning assets of its company, including captivating videos for its site. Without a customized tracking solution, they would not be able to track “on-page” events (or events that occur within a given landing page on their website) and measure the impact of this investment. With on-page event tracking, a world of information is open to managers- they can see how users are engaging with video, image carousels, and sound files on their site; how far users are scrolling on pages; and what links and calls to action are most effective. With this information, they can fine-tune their content production and enhance the user experience to drive revenue. Many website development firms can implement a standard analytics implementation for clients, but this often falls short of needs. You have a custom site with unique content, design, functionality, and specific demands for analysis- all of which require a custom analytics implementation. The custom solution should be set up by analytics specialists that understand the role of data in design, content production, marketing, and business decisions. No matter the digital-savviness of your organization or the skill of your website vendor, every new website will have bugs as it transitions to the real user environment. The trick is to have tools in place to track and automatically report critical errors so they can be addressed immediately. By doing so you maximize your investment by tapping your website vendor as a resource during your site’s warranty period. Ensuring your new site is functioning as intended is a necessary priority, but as important is the usability of the site. As users start to interact with your site, you’ll get real time feedback on how your user experience design is received. Remember, the new paradigm is for agile, flexible sites that are in a constant cycle of data collection, evaluation, and refinement. For example, our Analytics Team helped track numerous usability KPIs on SF Ballet’s new site including something we call “pogo sticking,” or the measurement of users hitting the back button on their browser as an indication of a less than ideal user experience. Through their custom dashboard, SF Ballet can see where “pogo sticking” is occurring and examine the content on the pages involved in this behavior to see what users are seeking when toggling back and forth, then revise content to meet user needs and make them more likely to continue on their path to conversion. SF Ballet is equipped to monitor KPIs regularly to quantify how the new site is performing and see if it's in line with expectations and meeting their objectives. Iteration will allow for ongoing improvement as user needs change. Managing a web project through to completion takes diplomacy and savvy to get many stakeholders to agree on such a visible manifestation of your organization. So, wrapping your head around data collection and tracking solutions like custom analytics implementations can seem daunting. 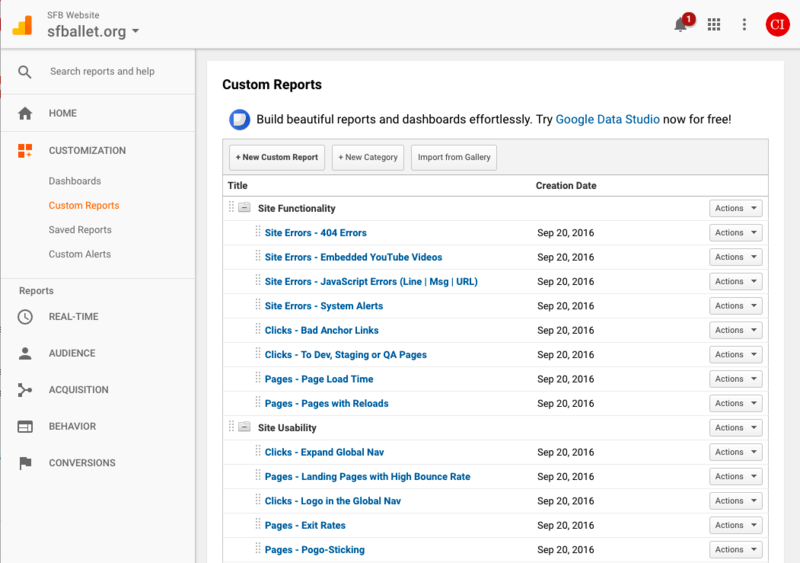 While we’re confident all marketers can develop a loving and functional relationship with Google Analytics, there are times when a specialist needs to be called in to do some heavy lifting. We’re here for those times! If you're preparing to launch a new or redesigned website, dive in with a detailed Analytics and SEO Checklist. 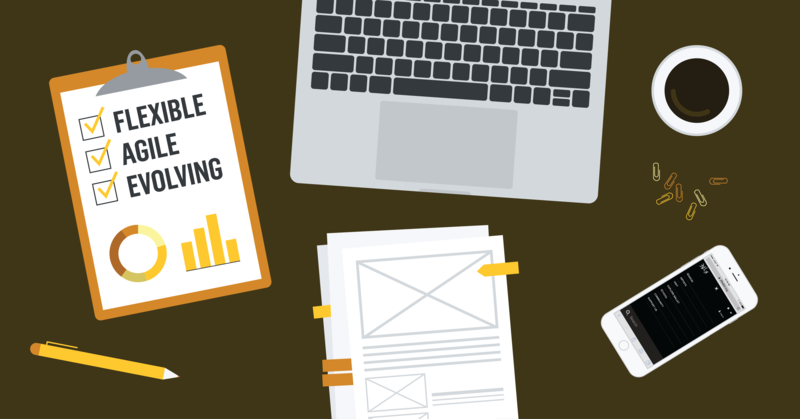 This checklist will give you step-by-step instructions to help you during the pre-launch, design/build, and post-launch phases to ensure your website is flexible, agile, and evolves over time. Do you have a website redesign on the horizon? Launch with confidence and the right analytics tools in place. Sign-up for a free, 30-minute session with our Analytics team to learn more.